This chair was once a stately bedroom dressing chair and holds fond family memories for my client. While in storage however, the cat claimed it and is responsible for the missing buttons, shredded fabric and clawed legs. On examination I see that the frame is very sturdy, woodwork is NOT deeply scarred and the springs are still attached but untied. Thank goodness there is no pet smell. This chair is definitely worth fixing and with a little bit of “ta-da” redesign its issues can be remediated without costing a fortune. I plan on painting the woodwork a “cappuccino” color, replacing and really beefing up the padding on the seat and back, adding buttons and double welting. I can picture a really gorgeous traditional fabric suitable for its clean simple lines. Click on the RRS Feed button to sign up for the “before and after” pictures and “how-to’s” in a couple of days. 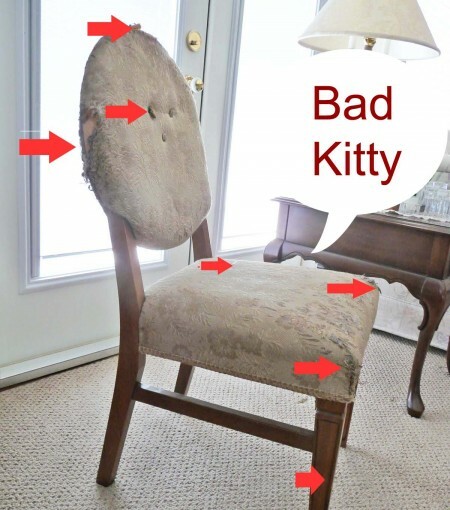 I think you will be amazed and inspired to tackle your own chair project. In the meantime my client is wondering how she can retrain the cat to stay off the chair! My client has asked…“Please, please leave your best suggestions” in the comments. The dog said.. "Don't look at me...the CAT did it"
When I’m not sewing, I’m working as a vet. This is what I tell my clients: cats have a great sense of smell and really dislike citrus. I’d try orange oil on the wood and even consider citrus oil on a paper towel placed in the chair. Also, place a scratching post covered in catnip somewhere the cat walks past every day (mine pass the post on the way to their food bowl). Refresh the catnip and orange oil weekly. Finally, clip those kitty nails once every 7-10 days. That’s my expert advice…hope it helps some! LOL! Yeah, but REALLY bad ones are the ones that claw ME! Oh…forgot one more thing. If all else fails, get some of that flexible rubb vinyl carpet protector (here’s an example of what I mean http://tinyurl.com/29hsycj). 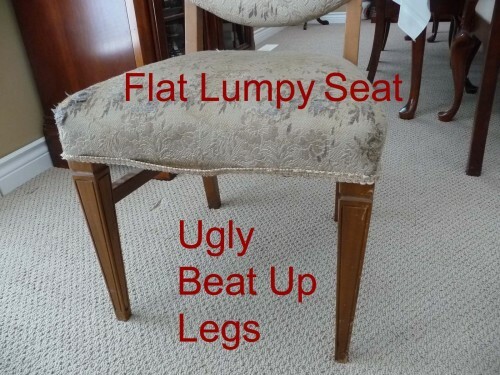 Cut it to the size of the chair and then place it in the chair wrong side up. When the kitty jumps into the chair he’s in for a surprise! Usually, after a few weeks, you can remove the vinyl and the kitty will be broken of his chair fondness. I used to have a BAD “STEP-KITTIE” that was a wire chewer (only my wires) and a shoe puker (mine too). Cat spent a lot of time wearing duct tape, …. still no cure. Cat died of natural causes… honest! Oh yes did I mention the “footprints” he left in my convertible top? 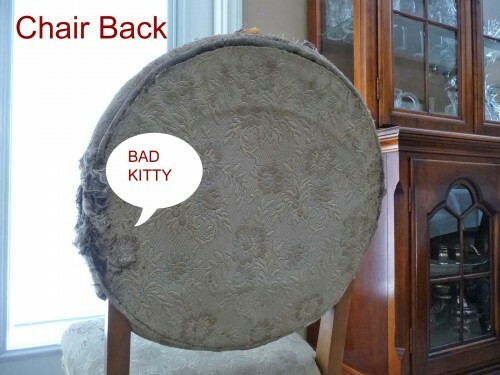 I would say that is a very, very bad kitty! Yes for sure this happed in my home! I have 3 kitty cats and one seems to like to scratch no matter what I try! I have a couch that needs help! I can identify +++ with this scenario!!! !